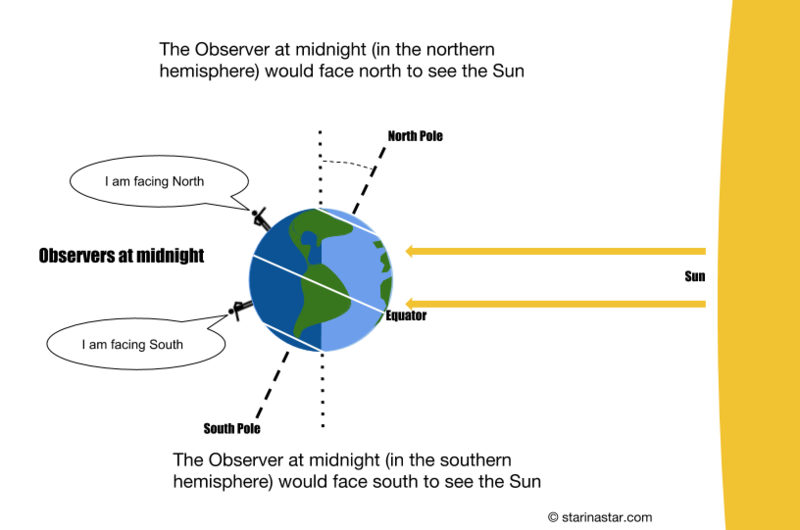 Quiz – Can we see the Sun at midnight? Where is the Sun? Can we see the Sun at midnight? Yes. We can see the Sun at midnight. But, only if we are at one of the polar regions during the Summer season. A quiz – seeing the Sun at midnight – don’t scroll til you try to answer! When you see the Sun “rising” in the morning at dawn you are facing the east. When you see the Sun “setting” at the end of the day you are facing the west. 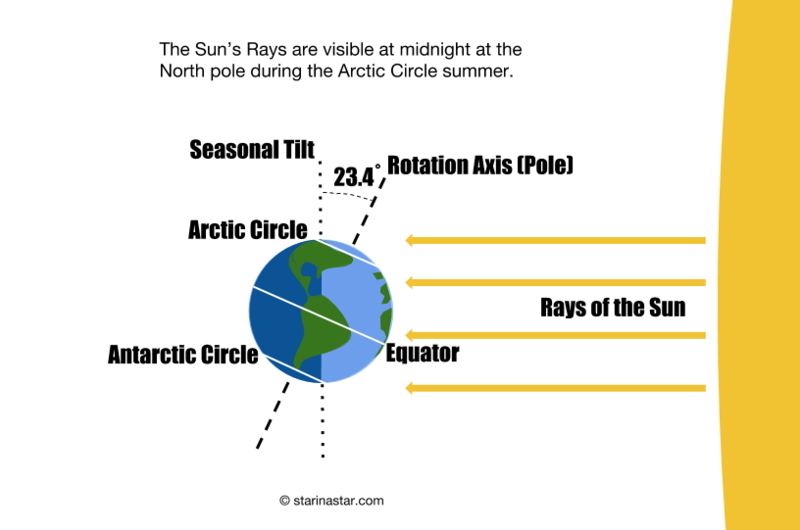 Assuming you are not above the Arctic circle and not too close to the equator… if you could look right at the Sun (when the night is exactly half over) – by looking through the Earth – which cardinal direction would you be facing? East, West, North, or South? 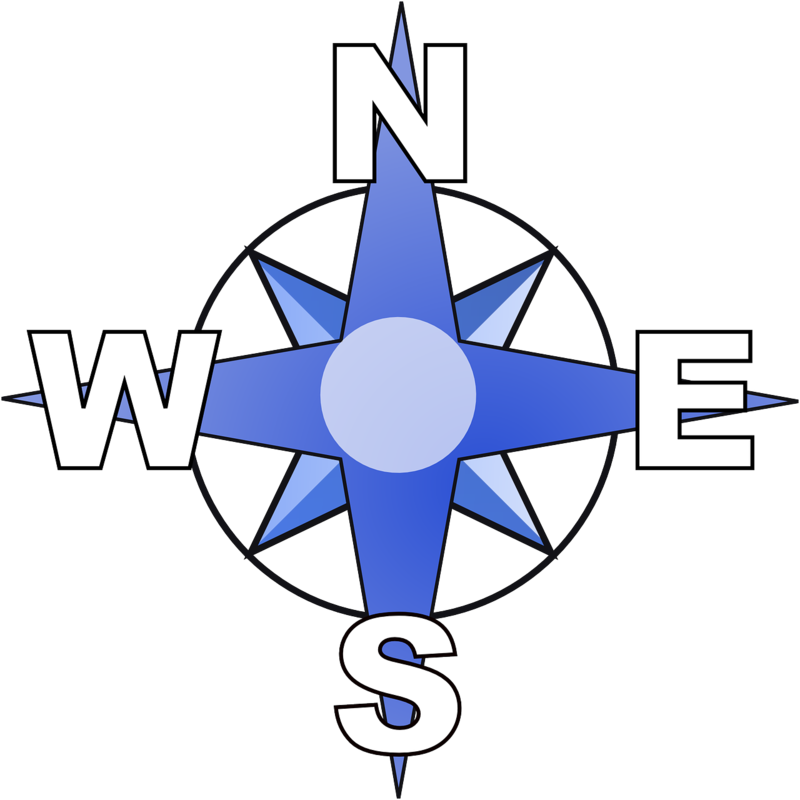 A compass rose showing the cardinal directions. 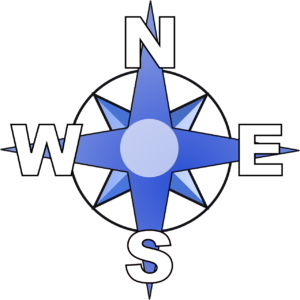 This quiz tests an observer’s ability to think about cardinal directions at the same time paying attention to meridian, time, and hemispherical location. When we see the Sun “rising” in the morning at dawn we are facing the east. When we see the Sun “setting” at the end of the day we are facing the west. When we look at the Sun at noon in the northern hemisphere we are facing south. SPOILER ALERT — And when we look at the Sun – as if the Earth were transparent – at midnight in the northern hemisphere we are facing north. In the southern hemisphere sunrise and sunset appear in the same cardinal directions (East and West). But as we pretend that we can look through the Earth at the Sun… at midnight… we are facing south. See the diagram below. I welcome any and all observation and feedback on this quiz! Contact me by clicking the blue bubble in the bottom right of this page. I learned a lot from this quiz about the Sun at midnight. I am really trying to imagine looking “through” the earth and it is difficult for me. Do you have any tips? Thank you for the comment and helpful feedback about learning to see the sun at night. The main thing to remember is that we are on the surface of a spinning globe. Try to imagine if that globe became see-through and you were able to see all the way through to the other side! If you look through the earth as if it were made of glass you would see the Sun. Hope that helps you understand how to see the sun at night.